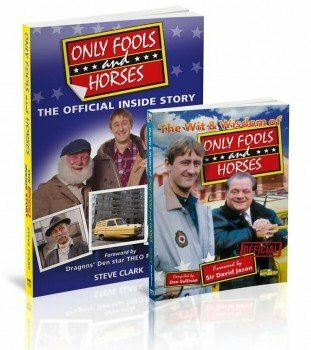 Here’s a brilliant offer: get our new official book The Wit & Wisdom of Only Fools and Horses, which has a foreword by Del Boy himself Sir David Jason, and Only Fools and Horses: The Official Inside Story by Steve Clark for the triffic knock down bargain price of just £9.99! Congratulations to Paul Kent from Hethersett in Norwich for being our latest Only Fools and Horses competition winner. 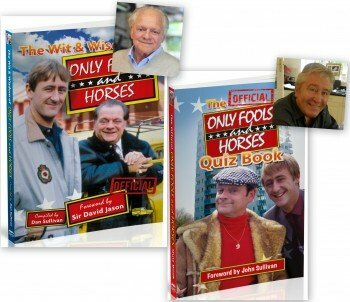 Paul has won a copy of our new book The Wit & Wisdom of Only Fools and Horses signed by Sir David Jason and a copy of The Official Only Fools and Horses Quiz Book signed by Only Fools creator, the late John Sullivan OBE. Congratulations to Paul and thank you to everybody who has bought one of our Only Fools and Horses books and entered the competition. Don’t forget we’ve got a great deal running where you can buy The Wit & Wisdom of Only Fools and Horses and Only Fools and Horses – The Official Inside Story for just £9.99 (including free delivery) by clicking here. You can follow @splendidbooks, @onlyfoolsbook and @steveclarkuk for details about future competitions. Merry Christmas from Splendid Books! Here’s an amazing competition with a chance to win a copy of our great new book The Wit & Wisdom of Only Fools and Horses signed by Sir David Jason and a copy of The Official Only Fools and Horses Quiz Book signed by Only Fools creator, the late John Sullivan OBE. All you have to do is purchase any one of Splendid Books’ Only Fools and Horses books – The Official Only Fools and Horses Quiz Book, Only Fools and Horses – The Official Inside Story and The Wit & Wisdom of Only Fools and Horses – between now and Midnight on Sunday December 16th and you will be automatically entered into the draw. The winner will be announced on Monday December 17th. Click here for details of our Only Fools and Horses – The Official Inside Story and The Wit & Wisdom of Only Fools and Horses special offer – two books delivered for just £9.99. PLEASE NOTE: Customers who have bought an Only Fools and Horses book directly from Splendid Books since June 1st 2012 will also be automatically entered into the competition. Anyone who has purchased one of our Only Fools and Horses books from another retailer can also enter the competition by sending a scan of their receipt or invoice by email to: foolscomp@splendidbooks.co.uk We are unable to accept paperwork sent by post. Rules: There is one prize consisting of the two signed books. Only one entry per household. Update 18th December 2012: this competition closed on December 16th 2012!